This one of a kind highly upgraded home in Madison Estates sits on the largest lot & is one of the largest homes. A pavered circular drive, stoned tower wiron gates lead into a courtyard wwater feature & fire pit. Over 5,500sqft. of open living space include 5bd, 6ba, work out room, media room & formal dining room. The large open great room has a fire place, custom media niche, 80'' TV, surround sound wspeakers, crown molding and a bar wbeverage refrigerator. The expansive gourmet kitchen has rich wood cabinetry, beautiful granite, stainless steel appliances, dual sinks, 2 wine refrigerators, pantry, built in TV, and an enormous island that seats 10. The Master suite is amazing with custom built-ins, fireplace, large ensuite & a walk-in closet complete wcustom built-ins. 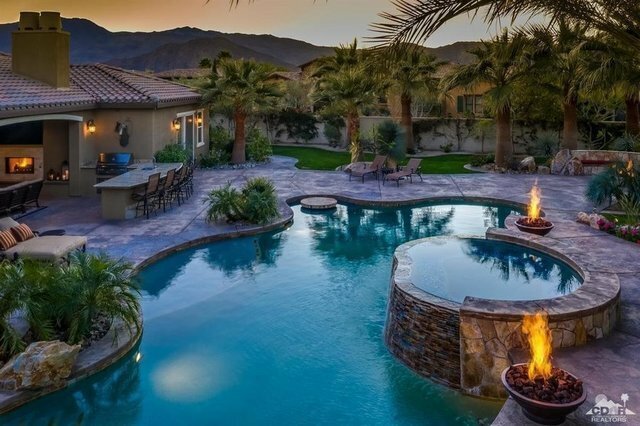 The rear yard is complete with a salt water pool, spa, BBQ, fire bowls, fire pit, outdoor heaters, misters, lounging area with fireplace and TV. 4 car garage has AC, built-ins & epoxy floors. Truly a must see!